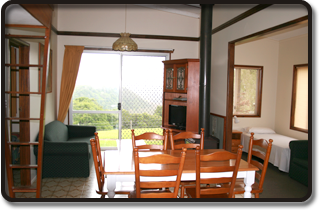 We have one Loft Apartment which is designed for families and larger groups as it can accommodate up to 7 guests. It has a separate main bedroom, which contains a queen bed. Three other single beds surround the open plan main living area. These beds are located behind partition walls thus offering some privacy. Two double fold out sofa beds are also provided. 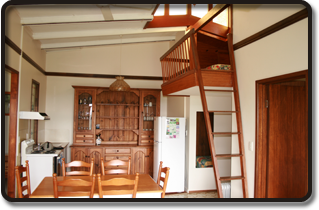 Additional sleeping for two is located in the Loft, which is a mezzanine floor that overlooks the main living area. It is accessible by ladder, and kids love it. The Loft gives the apartment a chalet type feel. The Loft is self-contained, has a full size kitchen, lounge and a log fire. A small charge exists for firewood. It has wonderful views over the valley. It is a ground floor apartment that opens directly onto the lawn areas and offers easy access to the pool and B-B-Q area. Off street parking is only a few meters from your door.